Designed by Peter Coolican and inspired by traditional Shaker craftsmanship, the Madison chair is as functional as it is beautiful. Handwoven with 600 feet of Danish cord that is both comfortable and durable. With strong Shaker influences, the chair features turned oak legs and stretchers pegged for durability and functionality. The fine brass pegs feature prominently on the contemporary backrest. Light, strong and comfortable, the Madison chair is a prime example of Coolican and Company’s approach to design. 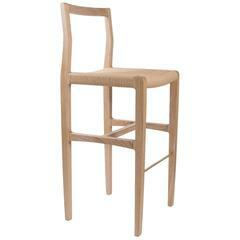 Available in white oakwood and blackened oak. Every item that Coolican & Company produces is made in a small, limited run, numbered batch. This is not fast furniture. Small batches put quality control in the hands of the master craftsperson to deliver a product that will wear better & last longer. Every board is carefully selected for strength and aesthetic, every part is precisely joined so that it can take a beating, and every finish is meticulously hand-rubbed. When it’s one of a dozen, not thousands upon thousands, each piece is special & each batch is unique. Moreover, we think that investing in our people and place is important and that craftsmanship is worth holding on to. We are building durable goods & a durable company that our customers are proud to support. 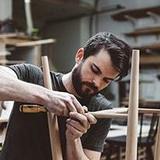 So, we choose to make our furniture locally and we choose to make it well. This is furniture that is built to last. Built to be used, loved, and shared. Sleek and comfortable dining chair. 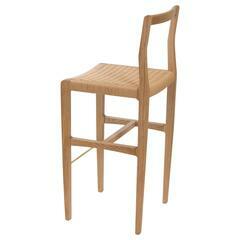 Shown in white oak with a custom-dyed handwoven Danish cord seat. A bench with subtle curves in cerused white oak with woven Danish cord seat, perfect for use in the bedroom, hallway, living space or kitchen. Measures: Seat 59”. A bench with subtle curves in cerused white oak with woven Danish cord seat, perfect for use in the bedroom, hallway, living space or kitchen. Measures: Seat 48”.